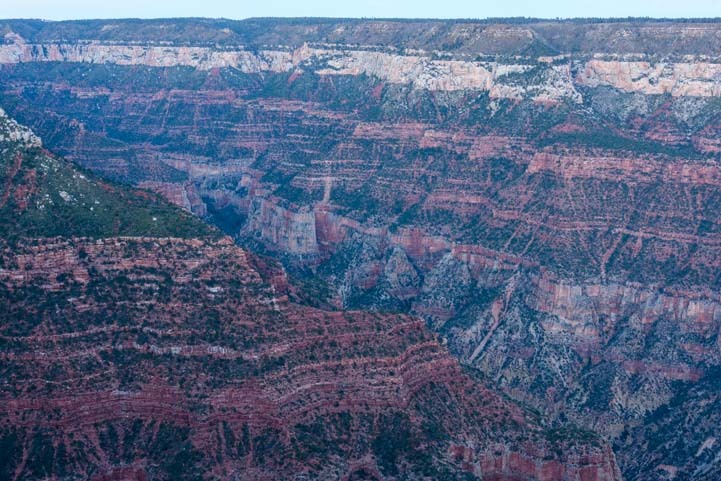 Blog posts from Flagstaff, Grand Canyon, Mogollon Rim, Williams, etc. 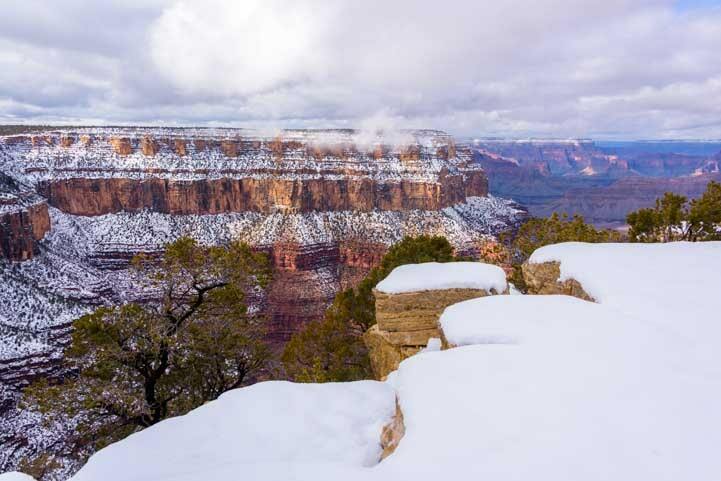 Grand Canyon – A Winter Wonderland with Snow! 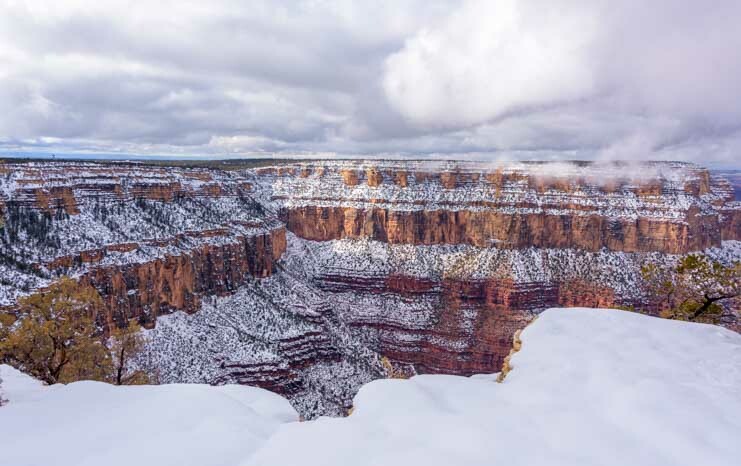 January 2019 – Even though we have a new Polaris RZR waiting to take us on lots of exciting back road adventures, we’ve had a hankering to do a National Parks Snowstorm Tour for several years now. Our snowy day trip to Jerome a few weeks ago further whetted our appetites, so this week when a blizzard was predicted for the Grand Canyon, we hit the road! 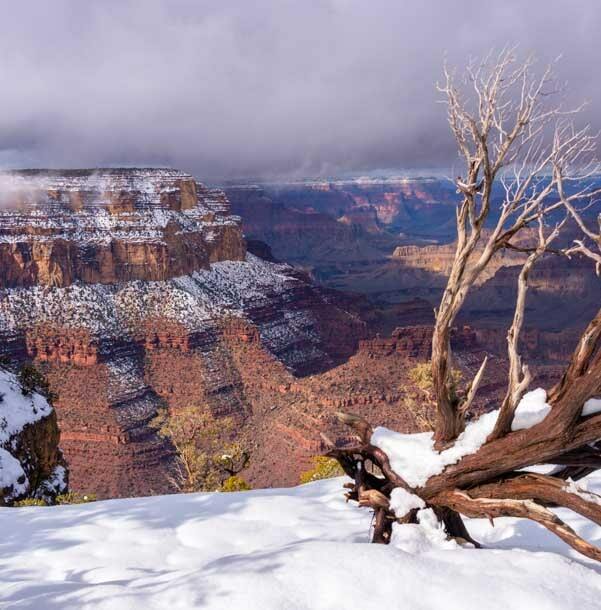 Grand Canyon National Park is a Winter Wonderland when it snows! We drove up from Phoenix to Flagstaff, Arizona, and when we got there we had to laugh at all the signs by the road advertising hats and gloves. 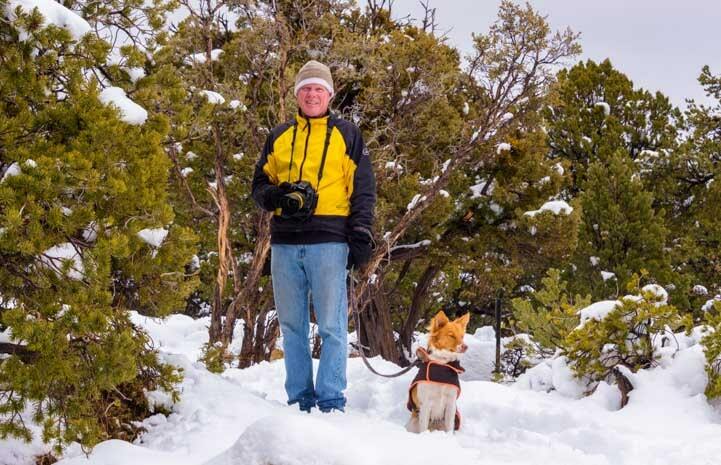 Desert dwellers love to go to Flagstaff to see snow in the wintertime, and sometimes they forget their winter duds (or don’t even own any!). 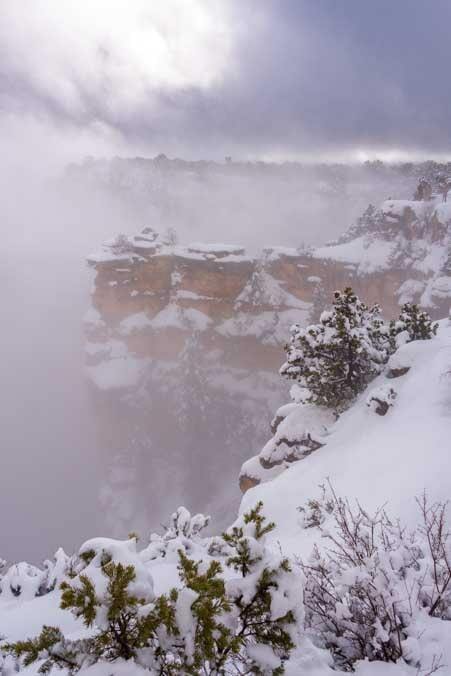 Snow had been in the forecast for Grand Canyon, but we saw only dustings and flurries until we climbed the last few miles to Grand Canyon’s South Rim about 75 miles north of Flagstaff. Then it began to snow hard, as it had been doing there for the last 24 hours. It was a little difficult to tell what was where under all the snow! 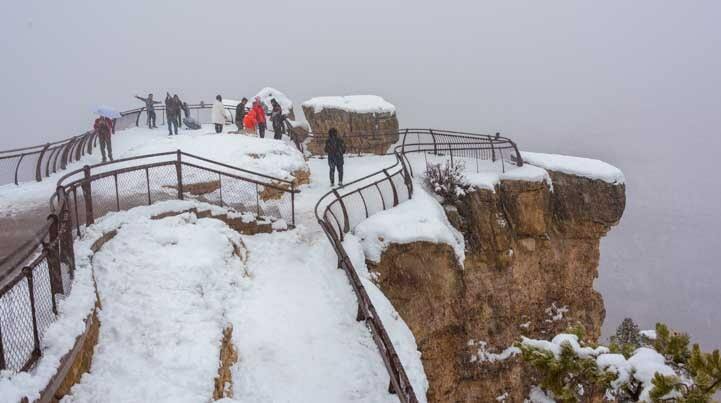 Things looked a little different at the Grand Canyon than we’re used to seeing ! 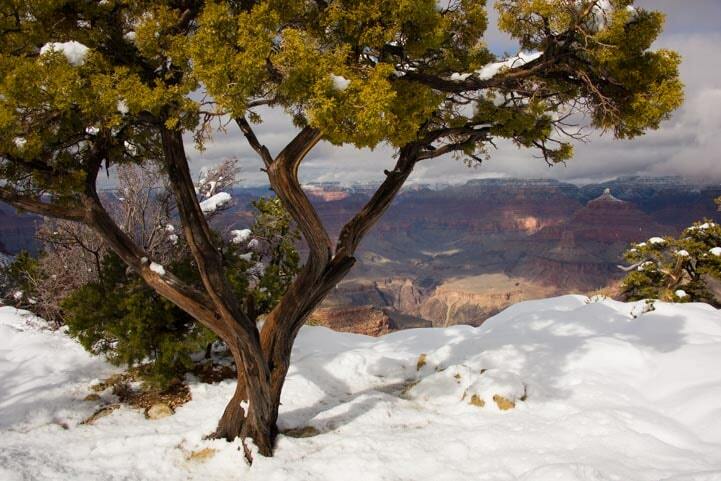 But much to our surprise, despite the snow, Grand Canyon National Park was hopping. Cars zipped here and there, the shuttle buses from the hotels to the rim were packed, and as usual, the languages we heard around us were from all over the world. Exhilarated, we bundled up and hustled out to the closest overlook we could find on the Rim Trail. There was a lot of snow, but we were ready for it! 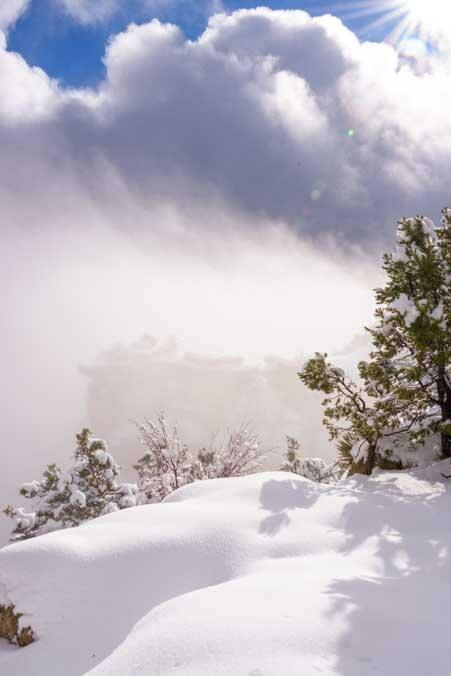 What a shock it was to find that fog filled the entire Grand Canyon! 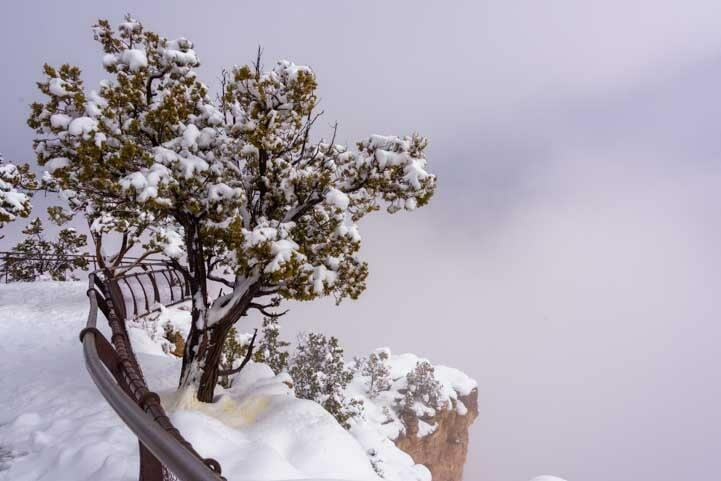 We could barely see from one overlook to the next, never mind across the whole Grand Canyon to the other side 10 miles away. Fog filled the Canyon and even obscured one viewpoint from the next! 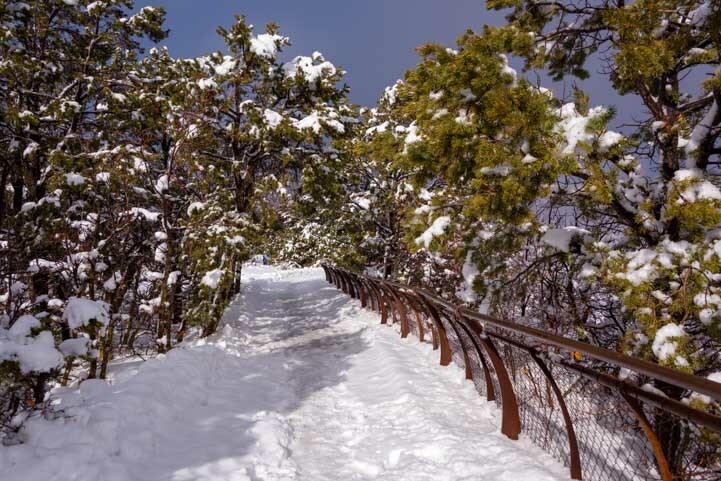 Nevertheless, tourists slipped and slid down the icy trails and out onto the overlooks to see what they could see — which was nothing! Tourists filled the overlooks even though there was nothing to see! 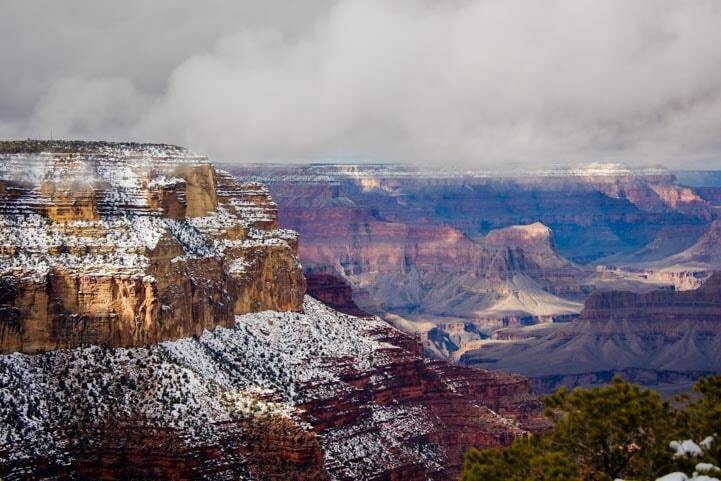 Despite the lack of a real Grand Canyon view, the fresh snow was beautiful and gave the Canyon a mystique we don’t often see. 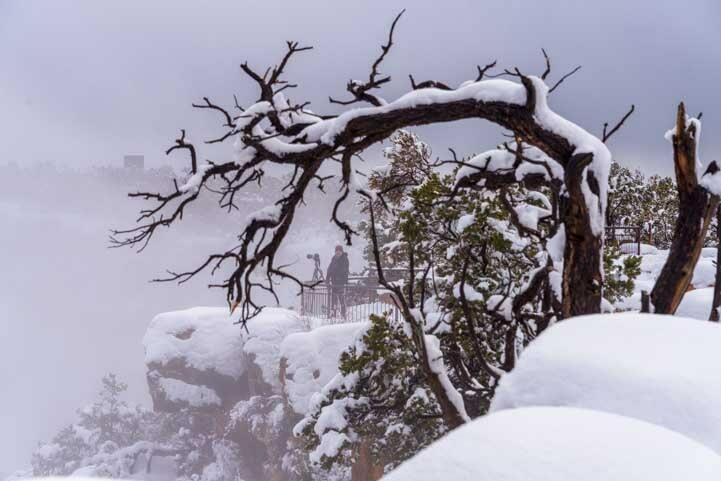 Fresh snow, fog and mist gave the Grand Canyon a special beauty. The fog blew in and out and the snow began to fall harder and harder. A woman standing next to me wondered why I was hanging over the edge taking photos. A photographer takes photos of…fog? 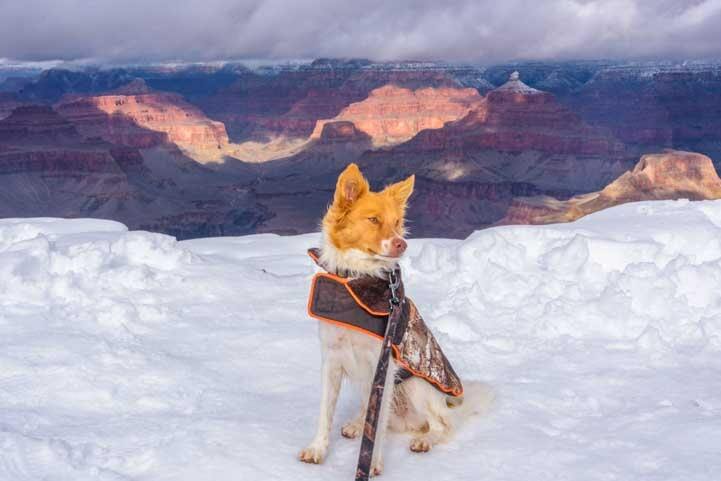 This was her first trip to the Grand Canyon, and although the snow and mist was lovely, she was really disappointed not to see the real view. “What does it usually look like?” She asked forlornly. even if there’s nothing to see! Usually this tree has a great view! If only she’d been able to stay another day. When we got to the rim the next day, the snow had stopped falling and sunlight had begun to shine through. The sun came out and cast shadows across the Rim Trail. And what an appearance it made. The light show across the canyon was spectacular! 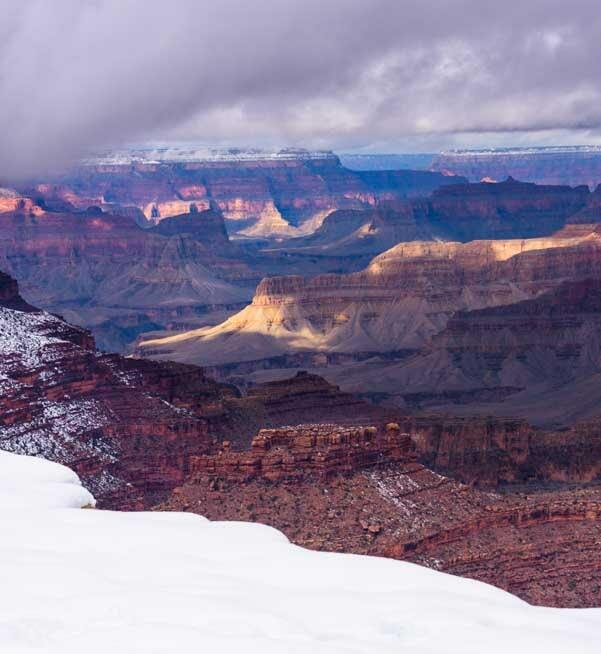 The sun and clouds chased each other across the Grand Canyon. What a glorious light show! We were blown away, and so was everyone else. A crowd began to form, and the usual dance of tourist antics and selfies began. Word got out that the Canyon was on display again, and the tourists lined up! 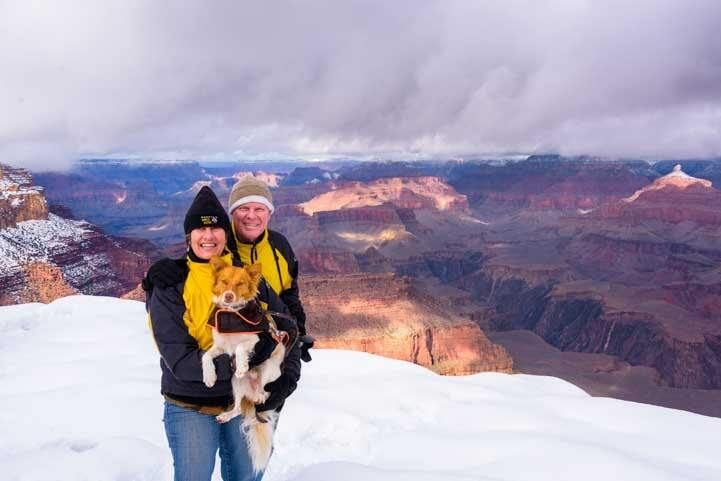 This Aussie/American couple was narrating a video about visiting the Grand Canyon in a snowstorm. We were mesmerized watching the light and shadows chasing each other through the billowing curtains of mist and fog. Meanwhile the light show went on. Puffs of misty clouds swept by. 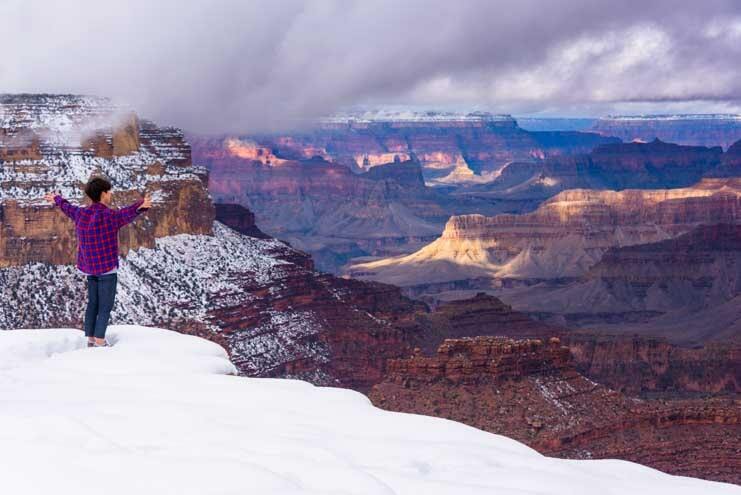 The Grand Canyon is magical at any time of year, but this was a special moment. Everyone was taking selfies and handing their cameras around, so we joined right in and did the same. We joined the selfie mania. Why not?! Buddy loved the view and being part of the view too! Fortunately for him, leashed pets are allowed on the trails above the rim. 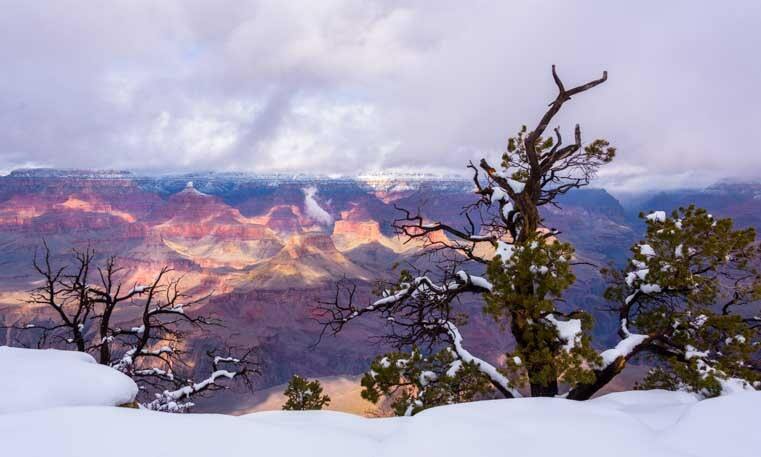 Most of the Grand Canyon overlooks were closed because the road to them hadn’t been plowed. The whole drive to Hermit’s Rest on the west side of the South Rim was closed and the road to Desert View on the east side was closed as well. 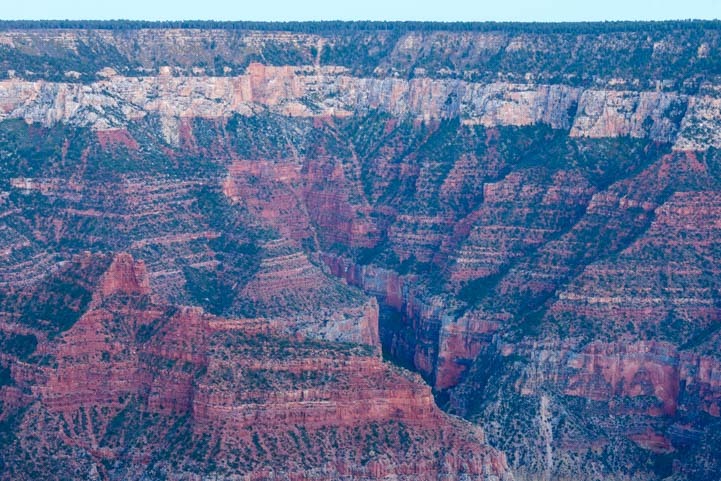 The canyon walls in that crack are thousands of feet high! 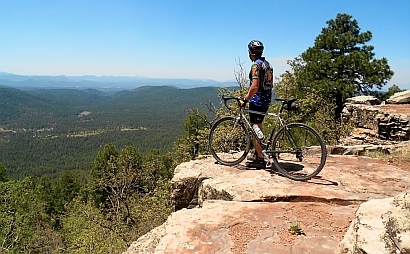 So, everyone stayed on the Rim Trail and visited just one or two viewpoints. 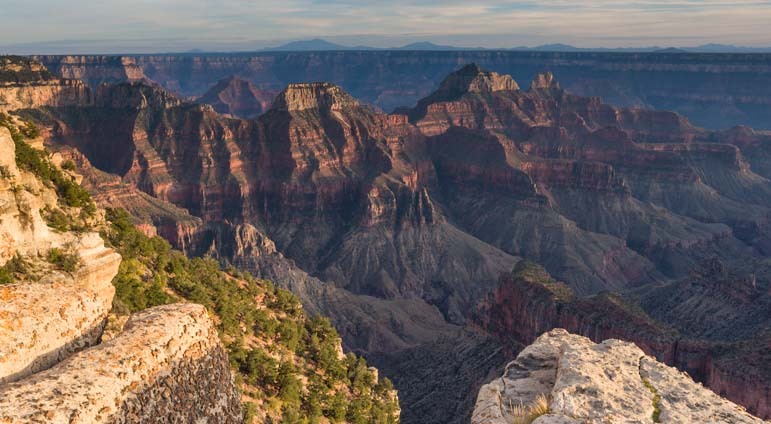 The funny thing is that even though the total number of tourists at the Grand Canyon was a tiny fraction of what you’d see midsummer, because we were all concentrated in one small area it was still packed! But it didn’t matter and the makeshift nature of things kind of added to the fun. This was a very special moment to be in this place, and everyone was thrilled to be here. We all knew the sun would last for only a short while this afternoon because more snow was on its way. So the mood was almost giddy. We had buzzed up from Phoenix in our truck and left our fifth wheel trailer behind. Even though the trailer camground was open at Grand Canyon and we saw some rigs with snow on their roofs, we’d decided to take a vacation from our vacation and stay in a hotel. 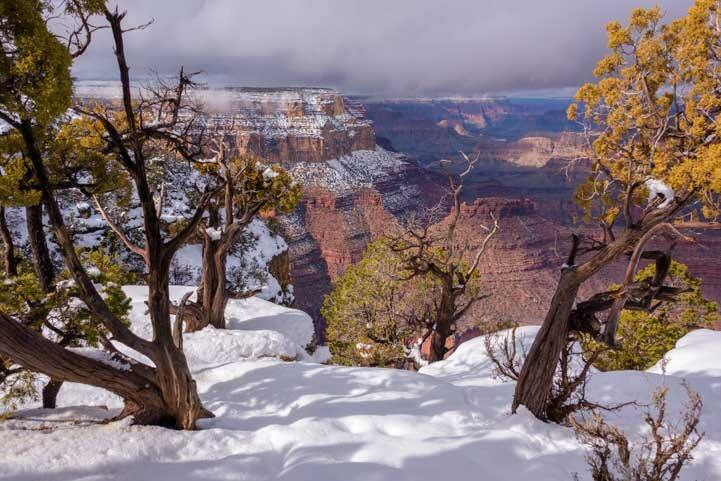 The fantastic thing about the Grand Canyon in the wintertime is that a lot of folks cancel at the last minute when they see snow in the forecast. So rooms were available for 50 cents on the dollar. 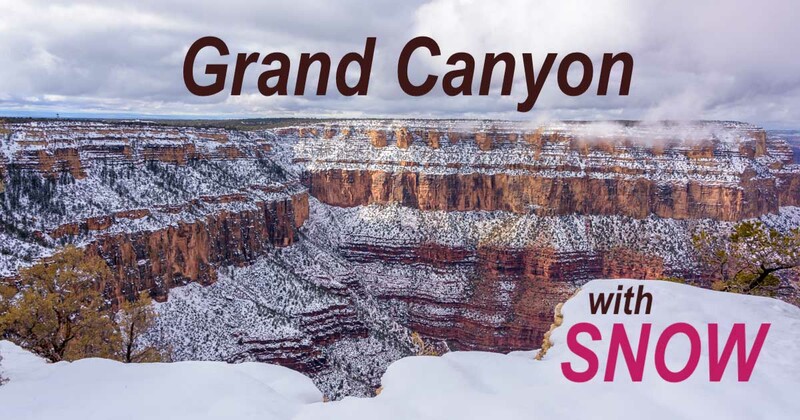 If you’re in Arizona for the winter and you want to see something very special, watch the weather forecast at the Grand Canyon and head there when the snow falls! 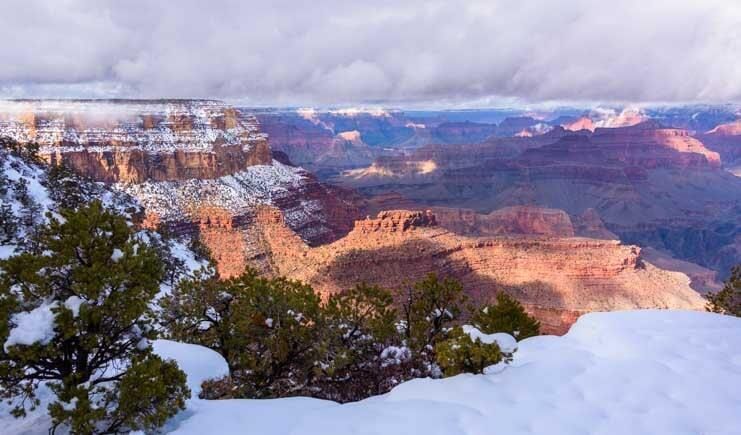 Next time you see snow in the forecast for the Grand Canyon, go for it! Never miss a post — it’s free! 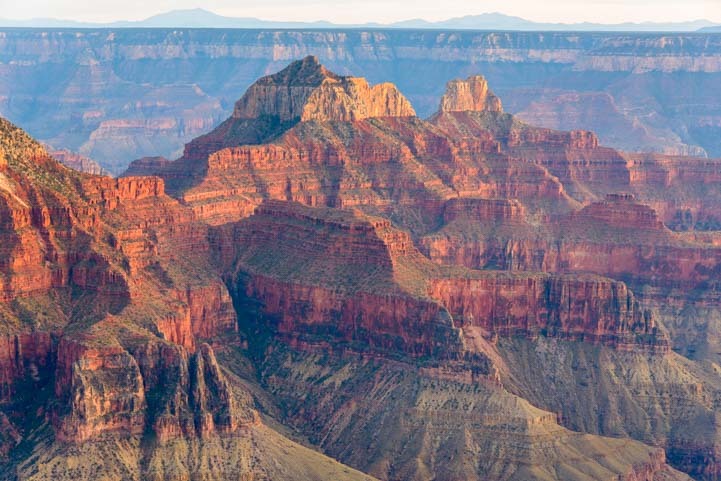 Where is the the South Rim of the Grand Canyon? More of our Latest Posts are in the MENU. New to this site? Visit RVers Start Here to find where we keep all the good stuff and check out our GEAR STORE!! 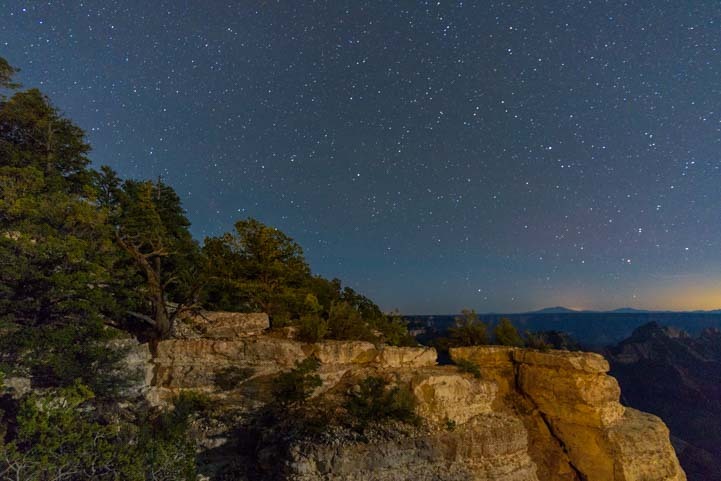 Grand Canyon’s North Rim – Magnificent & Intimate by Day or Night! October 2016 – After driving through the red rock wonderland of the Vermillion Cliffs in northern Arizona, we found ourselves at 10,000′ elevation on the Kaibab Plateau in beautiful pine forests. 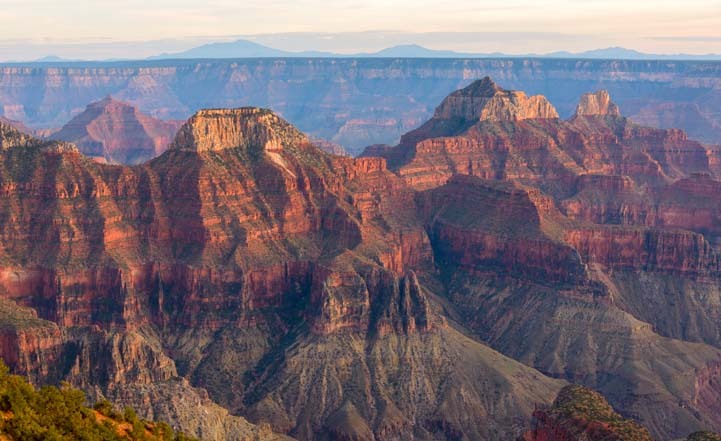 This is the home of the Grand Canyon where the earth seems to have split apart, revealing the massive crimson hued jagged walls that rise up from the Colorado River thousands of feet below. 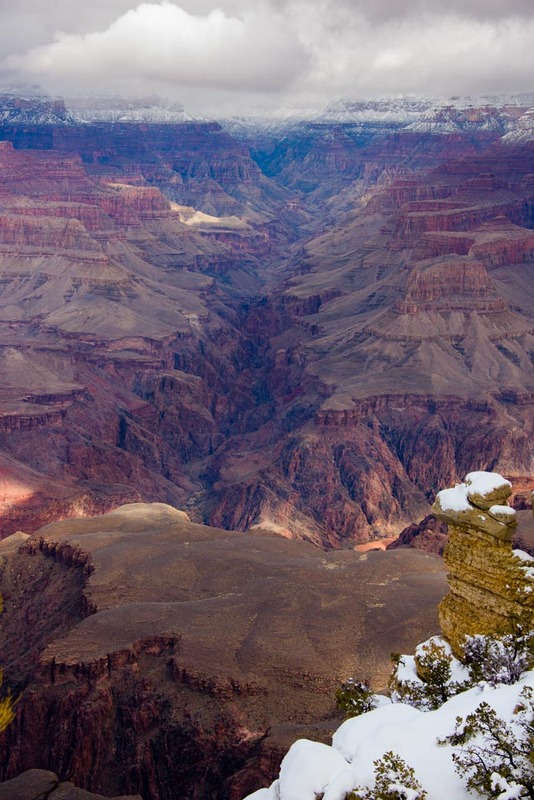 The Grand Canyon runs east to west for 277 miles and spans as much as 18 miles between its north and south rims. 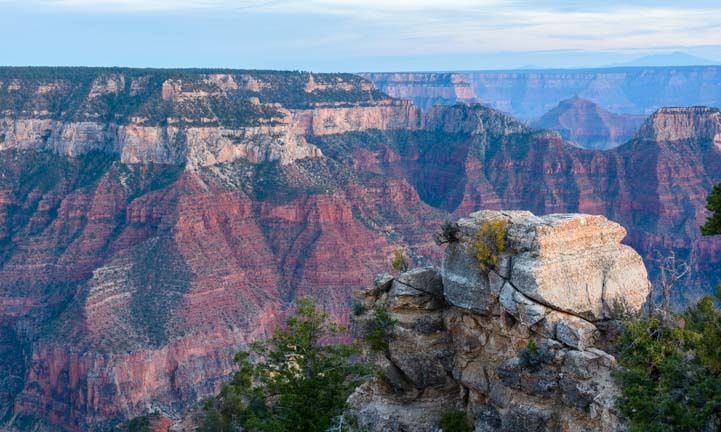 A huge region towards the middle of the chasm has been set aside as Grand Canyon National Park, and it has two entrances you can drive to, one on the north side of the canyon and one on the south side. 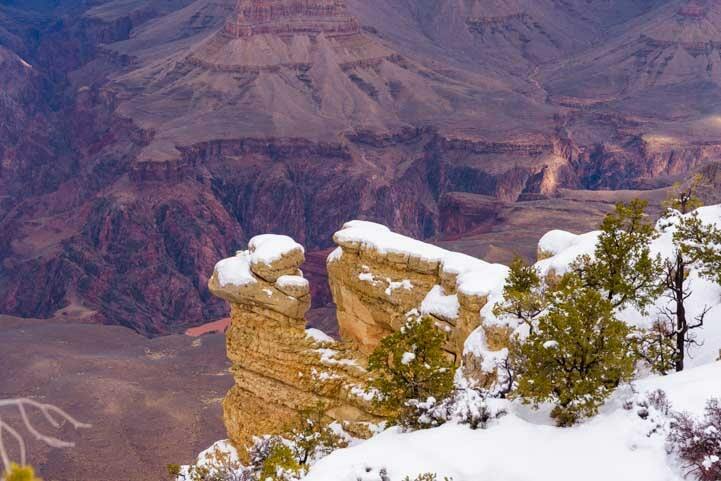 At each of those spots you can wander along the rim and peer over the edge to look 6,000′ down. A glimpse of the Grand Canyon through the trees. 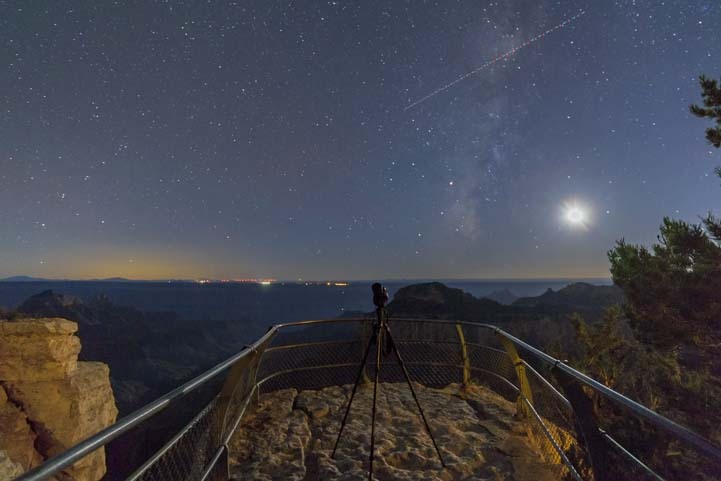 The South Rim is much more popular than the North Rim and is quite overrun with tourists, many making a once-in-a-lifetime bucket list trip from far distant corners of the planet. It is wonderful, but it is extremely busy. 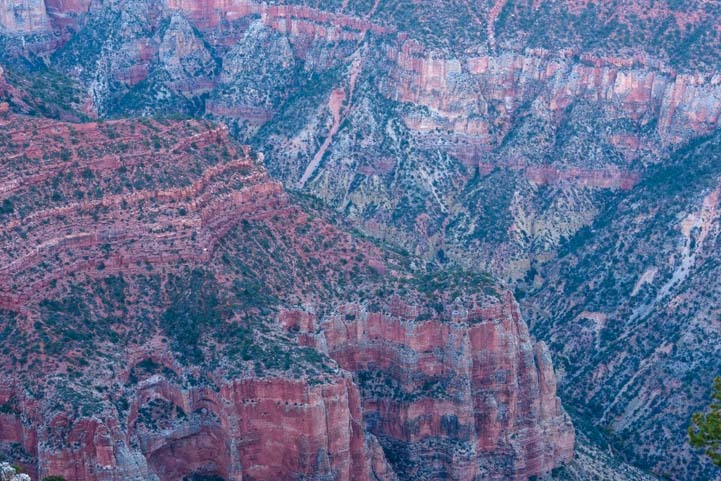 View from the North Rim. 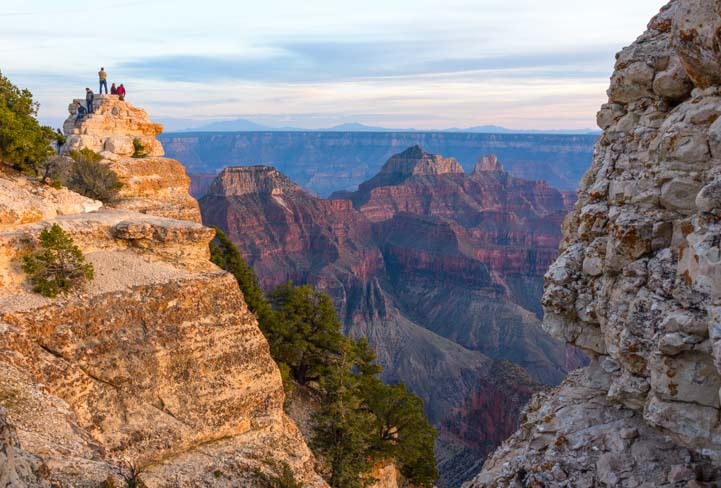 The North Rim of the Grand Canyon is a bit out of the way, so far fewer people go there, and most visitors are from the surrounding states. 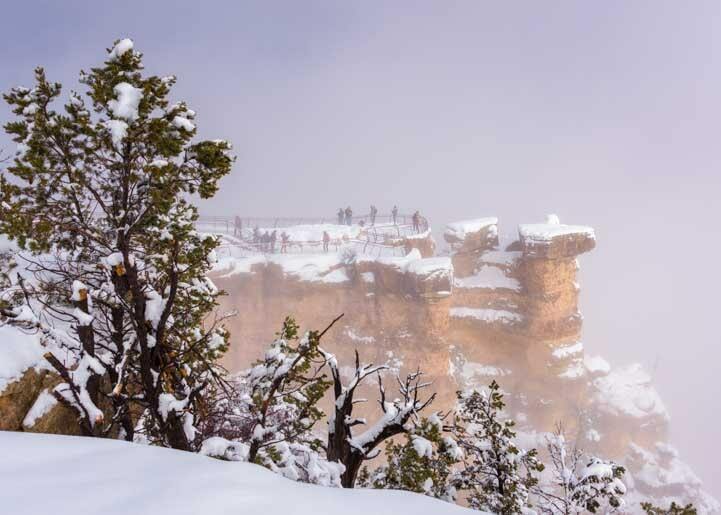 The North Rim sees 10% of the tourist traffic that the South Rim does and is 1,000′ higher in elevation. Looking across the Big Ditch! 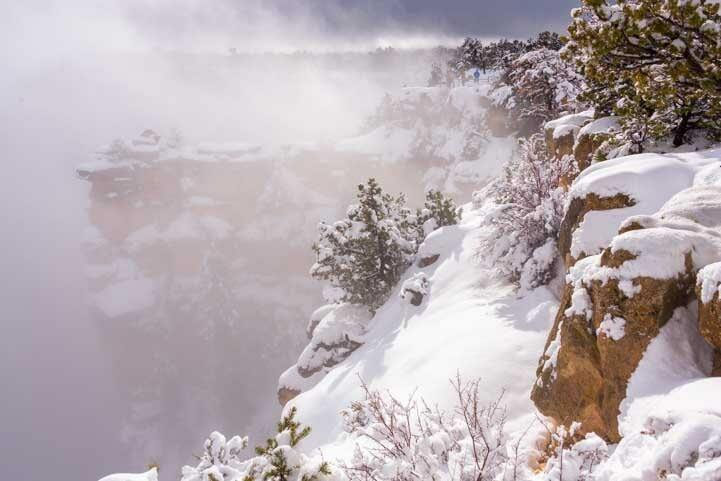 The North Rim has a very special lodge that was built by the National Parks Service in 1927. 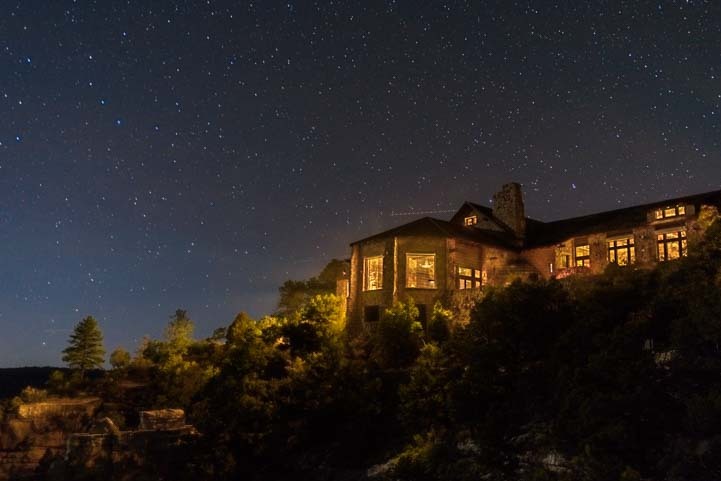 This wonderful and inviting stone building is perched right on the edge of the Grand Canyon, and the huge picture windows look out on a spectacular view. 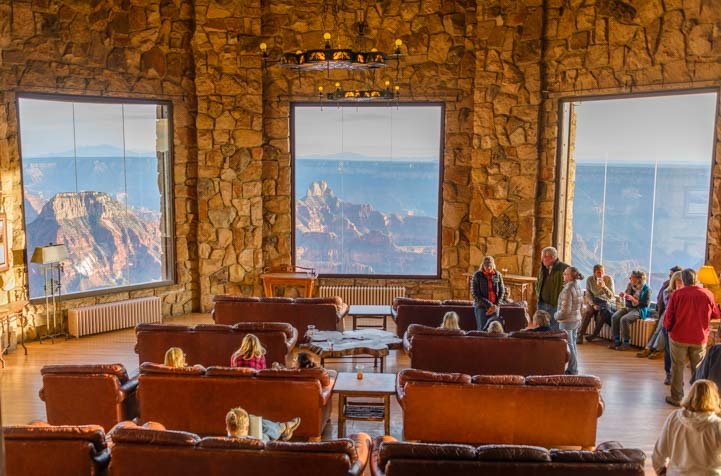 The Grand Canyon Lodge at the North Rim – What a view! 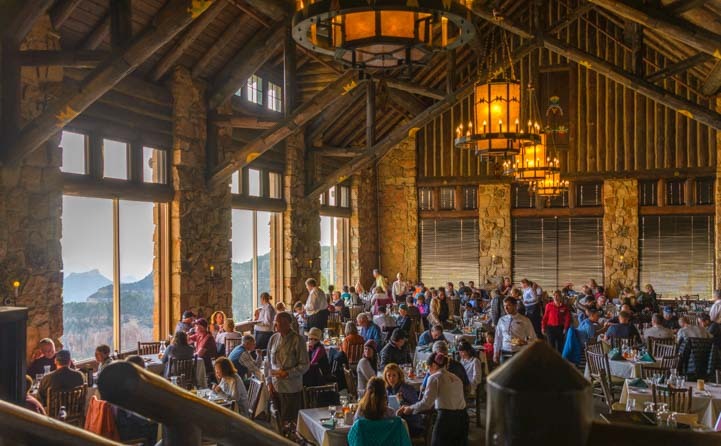 There is also a huge dining room where diners can eat dinner while watching the sun cast its golden glow across the ridges of the canyon right next to their table! A historic and beautiful spot for a dinner…with a world class view! Outside the lodge there is a low stone wall and a line of big wooden chairs where you can sit and take in the view over a beer. The deck behind the Lodge offers a relaxing spot to enjoy a drink and take a few pics. 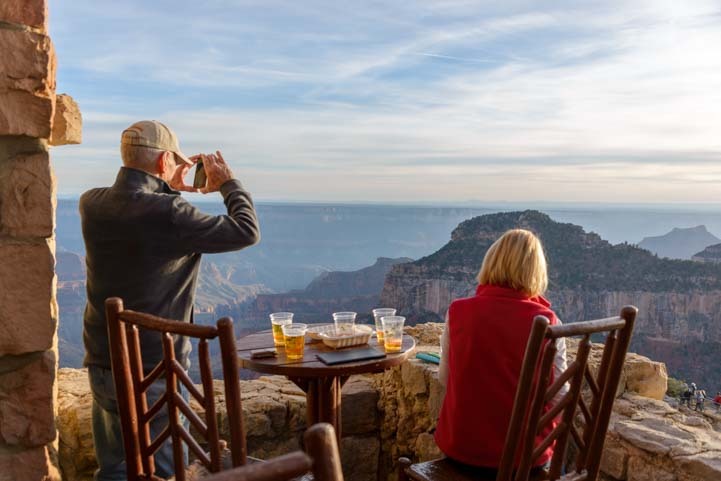 Tourists kick back at the North Rim. 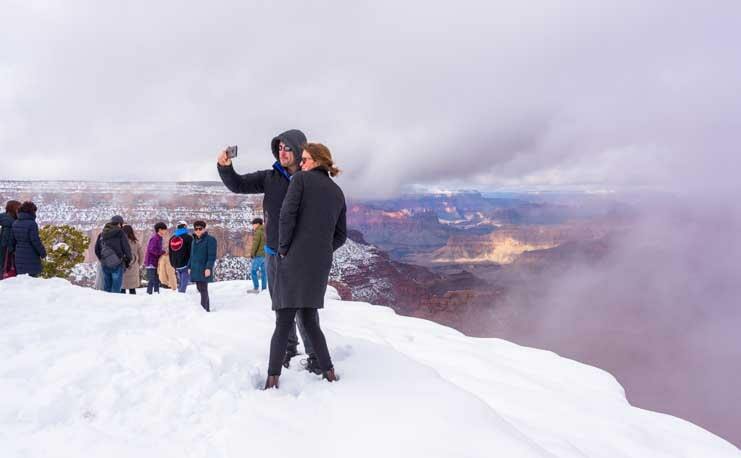 There is a feeling of intimacy and wonder on the rim here as strangers chat with each other and snap pics and take in the incredible view, enjoying a unique National Parks experience. A short trail leads from the edge of this deck out onto a peninsula that just into the Canyon and ends at Bright Angel Point. This is a fun paved path that provides endless opportunities for jumping up on the rock pinnacles on either side to get a better view. There are lots of places to scramble a little higher for a better view. 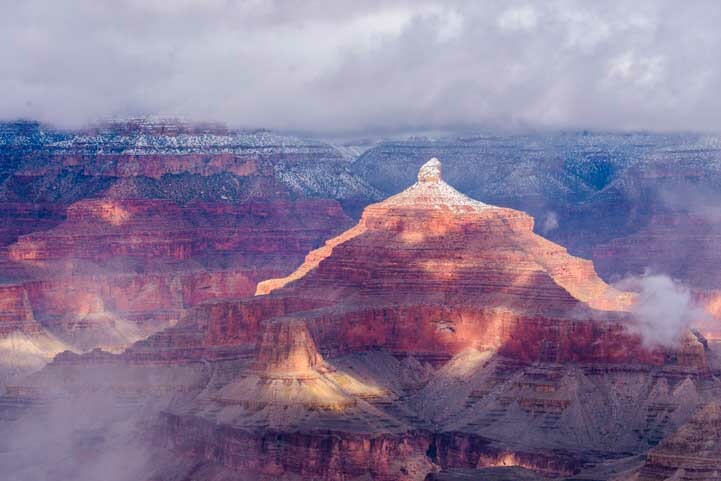 Of course, the best light in the Canyon is early in the morning and late in the afternoon. 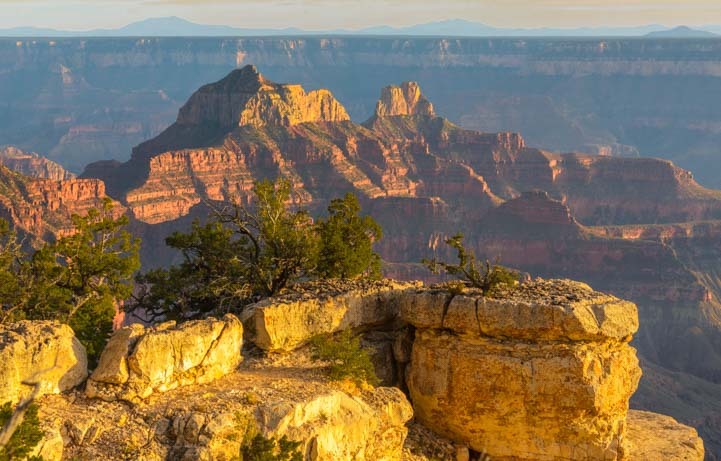 Late afternoon’s golden light brings out the contours of the jagged cliffs at the Grand Canyon. 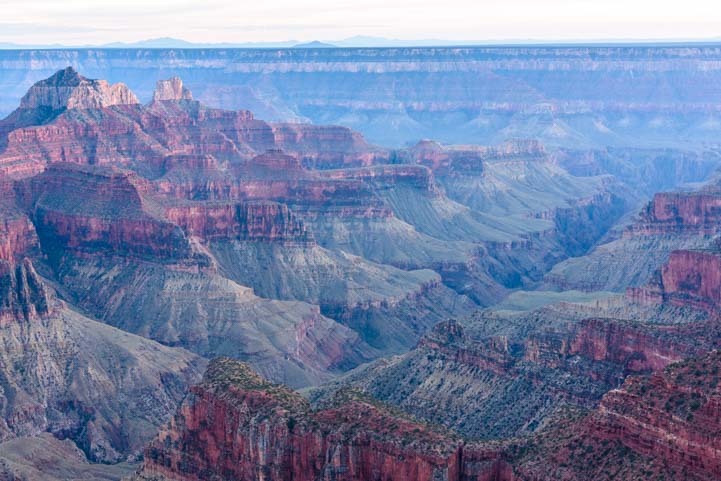 The sun was sinking in a very hazy sky when we were there, but the towering walls of the Grand Canyon still radiated a soft light, as if from within. Here and there couples and friends staked out a spot on a precipice to watch the sun fade away. As the shadows crept up the canyon walls from the bottom, the tips of the craggy peaks held the light the longest. In the final few moments of daylight, a thin ribbon of orange hovered over the Canyon. As the sun sank deeper behind the horizon, the colors in the sky grew ever more rich. Once the sun was gone from the sky, the contours of the Grand Canyon flattened out, revealing beautiful patterns. Patterns in the view at the Grand Canyon after sunset. Without any shadows to show depth, near and far blended together. 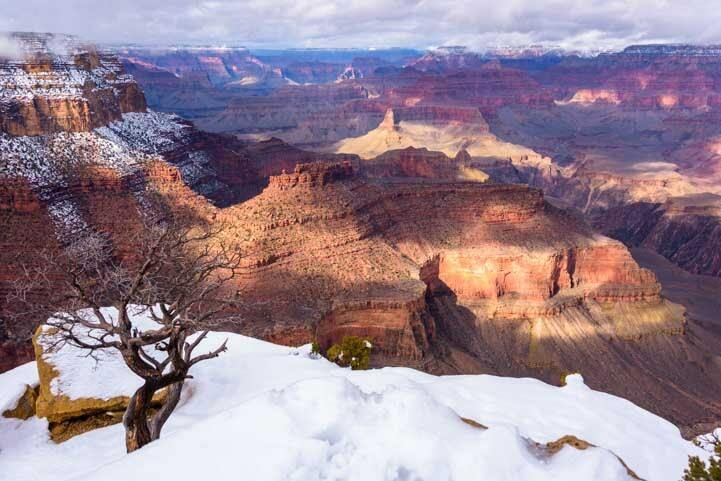 Because of the 10,000′ altitude at the rim, the North Rim of the Grand Canyon is very cold, except in midsummer, and the Grand Canyon Lodge closes October 16. 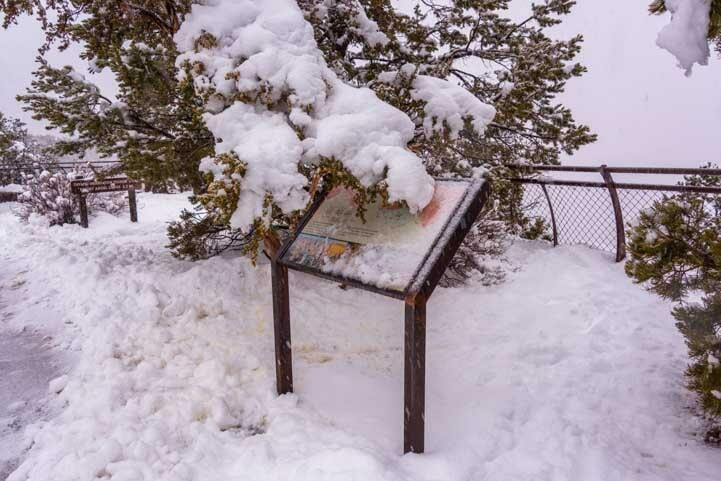 The 45 mile drive on Highway 67 between the hamlet of Jacob Lake and the North Rim remains open but isn’t plowed, and the self-service gas station in the park closes December 1. In mid-October we shivered in overnight temps that dipped into the 20’s. Nevertheless, we snuck out onto the trail in front of the lodge in the pitch dark, lighting the way with our new and very cool Lumintop flashlight (we reviewed it here) and got set up to take some shots. Above us, the lodge was well lit and looked very cozy and inviting. Occasionally we heard the excited conversation of revelers out on the deck and saw flashes from their cameras. The Lodge at the North Rim of the Grand Canyon. 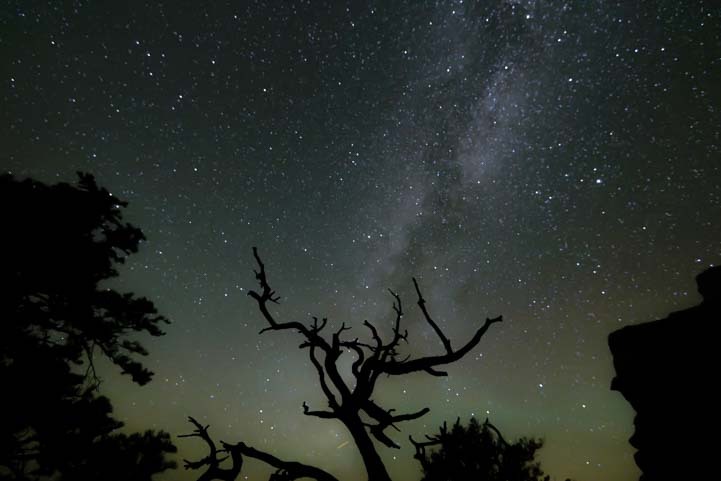 Slowly the stars began to shimmer above us, forming a dome full of glitter over the Grand Canyon. Both rims of the Grand Canyon are decorated with the skeletons of dead trees whose gnarly branches reach out in all directions. 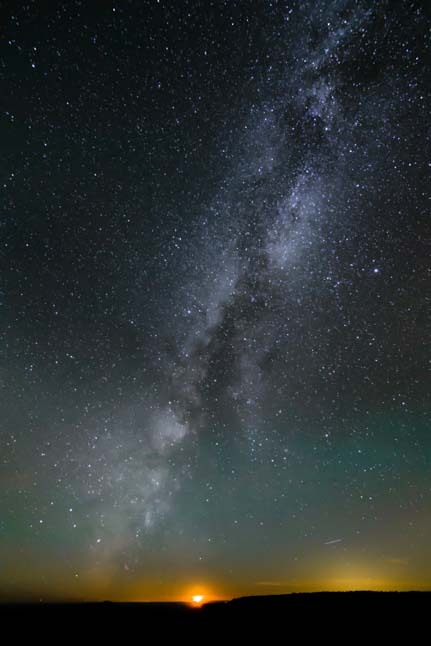 The Milky Way formed a majestic backdrop in the sky. The moon was setting and slowly sank into the horizon. It was nearly full and glowed orange. 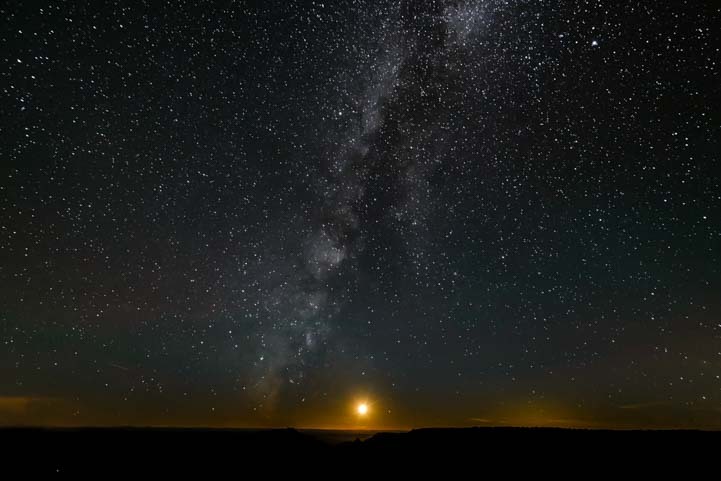 Seeing the moon at the horizon below the Milky Way reminded us of our many nights at sea on the Pacific Ocean. Sailors doing their first overnight passages are often shocked as they fly along in the pitch dark at full speed, squinting hard to distinguish the sky from the ocean, and then suddenly see a very bright light on the horizon right in front of them. More than a few hearts have skipped a beat, and more than a few frightened sailors have dashed to their radar display in a total panic as they tried to figure out what kind of mammoth ship was about to crash into them. Then they’ve suddenly collapsed in embarrassed laughter when they realized the enormous ship approaching them was actually the rising moon. We’d read these stories before our cruise, and of course we knew we were far too smart ever to fall for Nature’s little nighttime tease. So, it was particularly funny when it happened to us too! 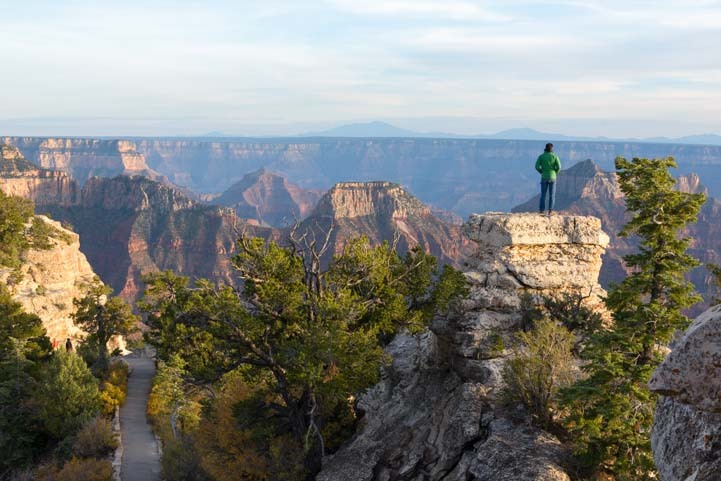 If the Grand Canyon is on your horizon for your RV travels, you can camp right on the rim in the campground at the North Rim. How totally cool is that?! However, you need to have a small to mid-size RV to fit into the campsites and drive the camground loop, and it is best to reserve a spot in advance. There are other RV camping options for slightly bigger RVs in Jacob Lake. 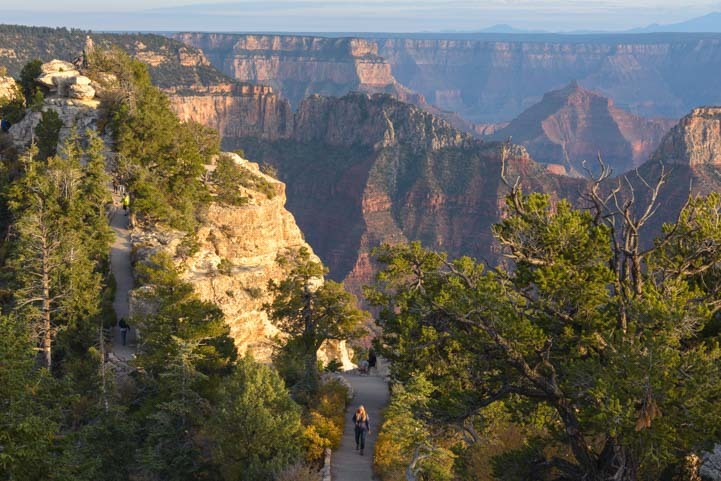 For folks without an RV, the Grand Canyon Lodge has a collection of charming small cabins that surround the main lodge building, and they are just steps from the rim as well. 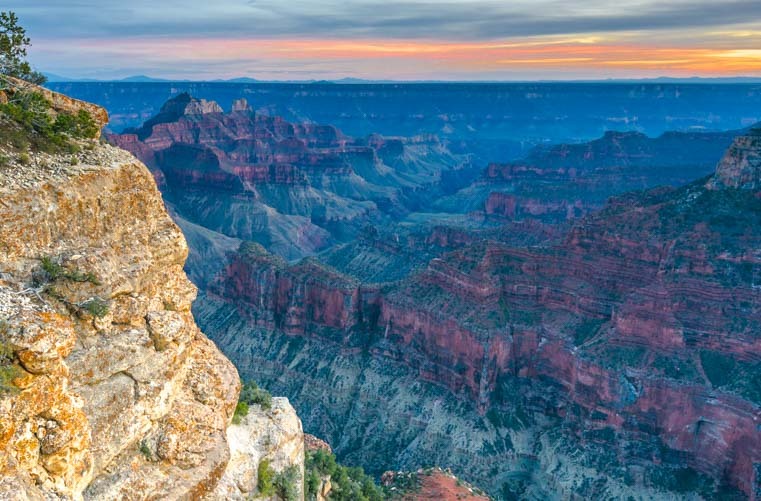 The North Rim of the Grand Canyon is quite vast, and many of the overlooks require a drive of 50 miles or so round trip to reach them. 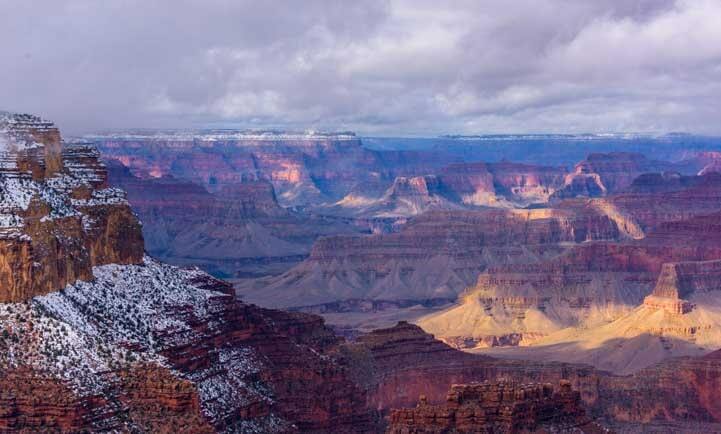 We breezed through the North Rim on this RV trip because it was late in the season and we couldn’t drive through Jacob Lake on our route from east to west across northern Arizona without dipping down to say “hi” to the Grand Canyon, if only for a moment. 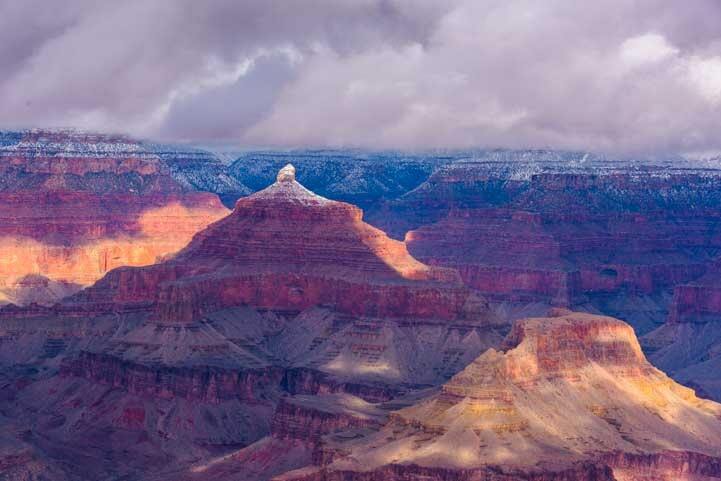 However, like all the National Parks, the Grand Canyon deserves a week or more to enjoy its many nooks and crannies in depth. 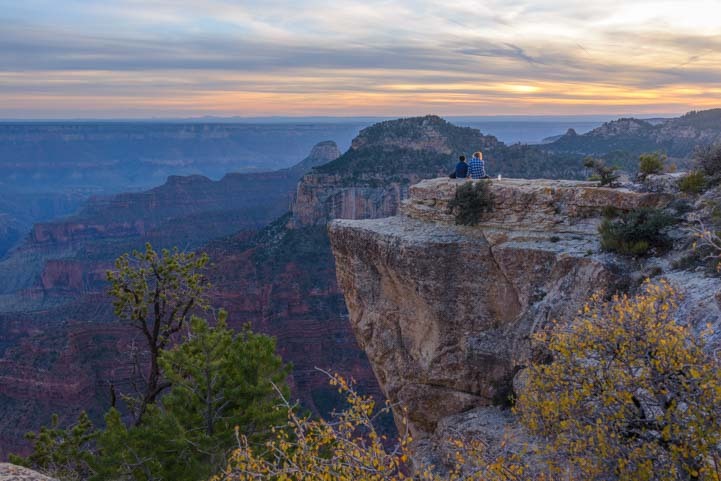 During our second year of full-time RV adventures, we stayed for a month at the North Rim. More info and links below. More of our Latest Posts are in the MENU. New to this site? Visit RVers Start Here to find where we keep all the good stuff!! What is happening to our Public Lands? Will photos taken on public lands like this beautiful spot on the Utah/Arizona border require an expensive permit in the future? October 2014 – There have been some interesting and disturbing developments on America’s public lands lately. For the last month, photographers have been up in arms over a proposal put forth by the US Forest Service to charge big fees for permits to take pics on public land. 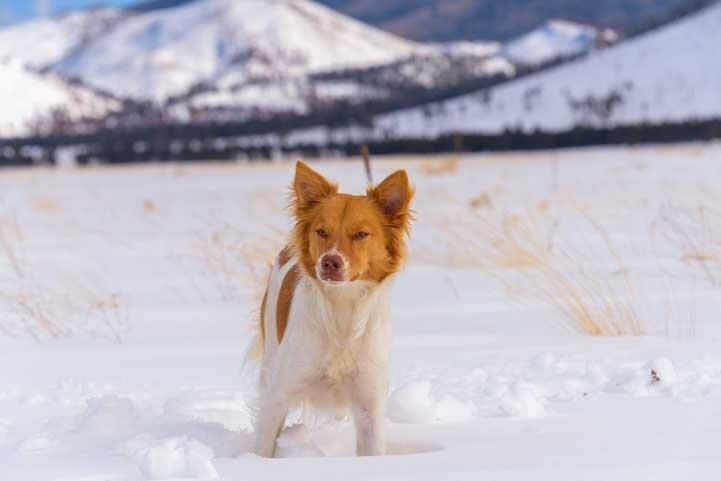 This news has gone viral since the USFS first announced the proposal in early September, and there have been oodles of irate blog posts and tweets from some of the biggest online news outlets. 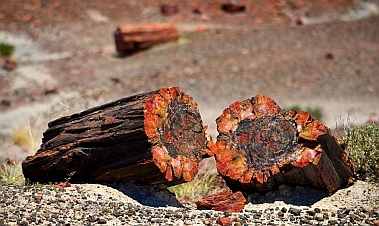 Petrified Forest NP and Mogollon Rim – Cool pines & hot rocks in AZ! Getting to the US required 3 planes. Starling chicks in a saguaro nest. Mom takes good care of the babies in their fallen home. few can resist a shot. Smoke from the Gladiator Fire approaches. Wildfire smoke obscures the sun. The awesome little paved rimside trail. It's great to be alive. Spring - a time for new growth. An elk calf in the grass. Petrified logs ready for splitting. They're cute, just don't get bit. A tree trunk that has cracked into drums. The National Park calls these rock structures "teepees." Collared lizard on a petrified log. Puerco Pueblo housed 1,200 people. A stork carrying a baby, for sure!! A rusting relic near the old Route 66.
become bleaker by the day. we made a hasty retreat back to Mark's family homestead in Michigan. immersion in southern Mexican culture. color everywhere, and flowering trees seemed to grace every front yard. of tulips, a heartwarming flower neither of us had seen for years. a gift we receive every day. wearing their little springtime crowns of white flowers on every limb. the cactus was still upright. adolescence, and in no time they had all moved out. were climbing and soon became intolerable. the edge of the rim with views to the valley floor far below. The rim is a jagged shelf of flat rocks that stick out in layers. to take in the view and get a photo. over us like a huge wave. edge of the rim for a few miles. the crisp air and pretty views. guy rowed a skull back and forth. as if it were our own private mountain home. "Jim Gray's Petrified Wood Company" is astonishing. the base. What a treasure trove! a few out by the geodes. a standing joke between us ever since. and swirl in non-treelike patterns. latitude was somewhere around modern day Panama. 13 species of large but extinct pines forested the area. between 1050 and 1300 AD. an otherworldly quality to this landscape. just a foot in height. you see in them is up to you. 66 is overgrown by prairie grasses. Parowan UT, Las Vegas NV, Williams & Sycamore Canyon AZ – Wow! Over the top Las Vegas glam. Fancy racing bikes at Interbike. A big horn sheep in the Las Vegas suburbs. One tourist came to town in style. Cruiser's Cafe 66 has live music in the afternoon. A cheery gas station from yesteryear. American Flyer is a coffee shop for cyclists. The road to Sycamore Canyon. After 20 miles of dirt roads, we find Sycamore Canyon. A dam holds the water back from Williams. school track team, hoping to match our old times. antique tractor show, and he was a whole lot faster. edge of the highway watching the cars go by. soon formed as we stared at each other. Grand Canyon Brewery beers are served. people to pay a visit. and definitely had to go check it out. that protects the town from deluge. water in the Sea of Cortez before winter's chilly fingers took it in its grasp. Wupatki Nat’l Monument – Ancient Indian Ruins & Great Camping in AZ! Flagstaff's San Francisco peaks seen across the meadow outside Bonito Campground. Coconino Forest's ponderosa pine woods. sunflowers is now parched and cracked. Some sunflowers line the road. Sunset Crater just before a downpour. Looking down at Nalakihu from Citadel Pueblo. View from inside Wupatki Pueblo. Looking out at the high desert plains from Citadel Pueblo. Wupatki Pueblo and its round Kiva (gathering place). Wupatki Pueblo, home for about 100 people. Mark plays with the blow hole's breezes. Our picnic is cut short by looming black skies. the first step of our re-entry into civilization and the US, and each stage of re-entry was a shock. time to think about that; there were chores to do! pillaged from it for the boat. Mexico felt like a far distant dream. trunks, but the tops are green. orange-red top to this day, and the sun and shadows spend their days playing with the color. "sin agua" or "without water." horizon, but there are few trees or other protection between the open lands and the sky. rock cliffs. The cliffs provide the only weather protection in the area. The Sinagua people understood real estate: location location location. drop of rain. The deluge that came now was fantastic. as we took off to head north to Dixie National Forest in Utah. 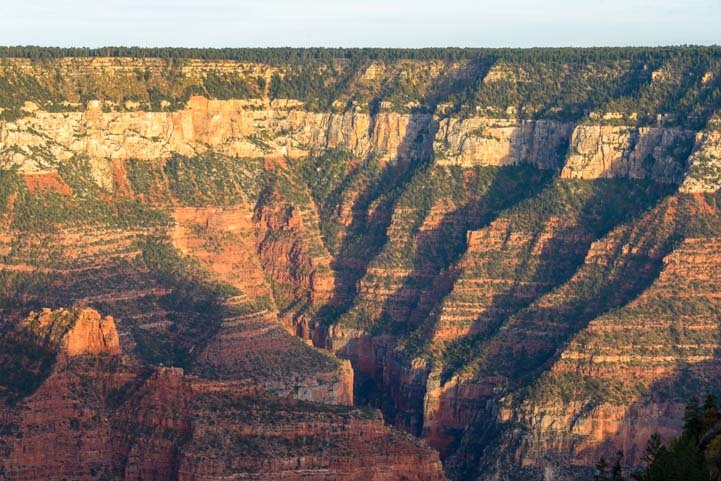 Grand Canyon’s North Rim – Its Better Half! The road to the North Rim winds through meadows. Monsoon season was just starting. We came across a clearing overflowing with lupines. feet, making the warm summer season very short. When we first arrived the sun was abundant and the air was warm. clearing was lined with aspen that quivered whenever the wind blew. setting sun. It was magic. dropping vistas while clicking away on the cameras. Cape Royal, a massive lookout area, lies at the end of this road. skipped on our way out. region, growing crops on a plateau 5,000 feet below at the Colorado River in the winter and moving up to the Rim in the summer. 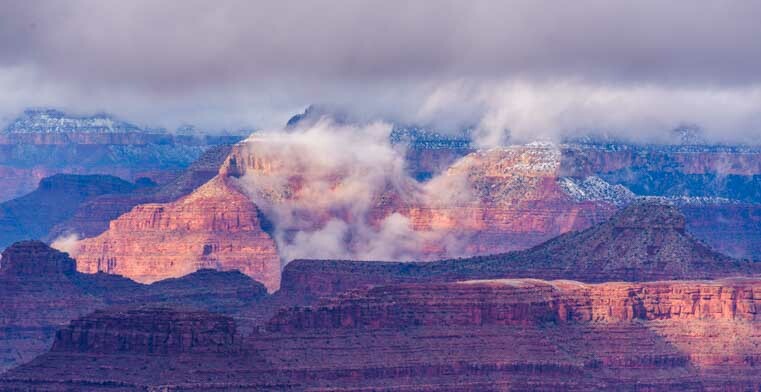 down on the Colorado River, it would be only natural to believe that the mountain held a mystical power to create clouds and rain. and a light rain began to fall. peninsula that the North Rim Village is built on. leaving a deep trench in its wake. Point Imperial is not hard to miss. Sunset Crater, AZ – Looks Like it Exploded Yesterday! Campsite at Bonito in Flagstaff. Neat spot for a house! run about 2,000 lbs or more over their GVWR. retired the truck for a while, sticking to our bikes as much as possible. was done, and the system has been phenomenal ever since. Wherever we are, it is always as if we have full electrical hookups. Sunset Crater National Monument. This is a beautiful area for cycling, as there is no traffic and the road is smooth and scenic. can almost see the ripples and waves as this thick angry goo washed down from the mountain. In the distance the San Francisco peaks were still snow capped. brought them much needed water for their crops. the view at the top. then drop south to get there. This is a FANTASTIC bike rack. Our old Swagman rack ruined our bikes. This one carries them in style. On an RV use just the rack (left), on a car you can add the extension (right). For our detailed review & pics, visit: Kuat Bike Rack Review! A Bottle Jack and a Lug Wrench are handy tools for changing a flat on the road. Our 12 ton bottle jack and 24" lug wrench are big and strong enough for our 36' 5th wheel. For more RVing tips, check out our page: RV Tips & Tricks!